Angle describes the angle that a thread makes with the vertical axis. But here is one catch, do you see that the peaks are slowly dropping? 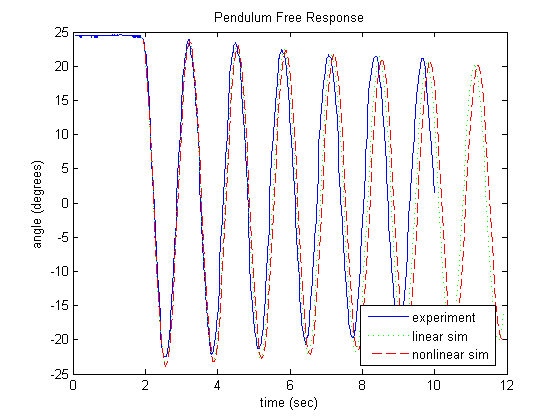 This constant drop in the peak or amplitude of the pendulum shows that there is an energy loss somewhere along the time frame and it is not constant, it varies with velocity of the pendulum. This energy loss is in the form of "damping" of the structure. Damping is a function of velocity and the more the velocity, the more will be the damping force. This damping actually takes energy away from the system. So is it a good or a bad thing? It is a good thing for buildings as we do not our building to stay under constant motion. We want the motion to stop and damping will help us in doing that. Higher the damping percentage, the faster the building will lose energy and it will become stable. So I think now you will know the meaning of term "Response" of the system. But there are two types of responses, "Forced response" and "Free response". Free response is the one when an object moves freely without any application of external forces. Just similar to our case of simple pendulum, but in case of forced vibration, there is a constant application of force to the system, i.e. constant pumping of energy into the system. This changes everything and a forced vibration is the one we are interested in. But a forced vibration is a complicated process but let us hold on to that topic and first look through a term called mode shapes of the system and natural frequencies of the system. When I first told you to imagine a swinging pendulum, what was the first image that popped into your mind? It is a regular blob of mass swinging left and right in your grandfather's clock. It is not difficult to visualize because all the pendulums in the world swing in the exact same way. It is called a simple pendulum and the motion you just visualized is the mode shape of the system. It has only one mode, because it has only single degree of freedom. The frequency with which it oscillates back and forth is called the natural frequency of the pendulum and it depends on the length of the pendulum. Thus the shape it follows is called eigenvector of the system, it will remain constant no matter what you do, only its magnitude will change, not its shape. You can test this by applying different magnitude of force at the bottom of the pendulum and it will swing faster and harder but it will never change the shape you imagined. Also the frequency of the oscillation will also remain constant. If you push it harder, it will go further but it will move faster, so it will take exactly the same time for the pendulum to complete one cycle. This natural frequency is called the eigenvalue of the system. Now imagine the same thing happening with the building. A building has say 3000 different nodes and each node will have 6 degrees of freedom. This means that the structure will have 3000 x 6 = 18000 degrees of freedom which in turn means 18000 different natural frequencies. But we generally restrict certain degrees of freedom, let us say by fixing the beams and columns at its ends. But still it has many different degrees of freedom and called eigenvalues of the system. Each natural frequency of the system will have a particular set of eigenvector associated with it, also know as mode shape. As shown in image above a simple column can have different fundamental mode shapes. When a building shakes then the overall displacement as a function of time for a particular building can be divided into these simple mode shapes. We can actually calculate different mode shapes of the building by forming the mass matrix and the stiffness matrix. Now the each mode will have its participation to the global response of the system. What do I mean by participation? Suppose in box there are 30 balls of three colors, 15 of red, 10 of blue and 5 of black. This means that 50% of the balls are red, thus contribution of red colored ball is 50 %. Similarly, in case of a structure, when it vibrates each mode has its impact on the overall deformation of the system, some modes impact more than the others. A mode with the lowest frequency or the highest time period is the one which impacts the most. This is called modal mass participation factor which shows how much a particular mode is contributing to the overall deformation of the system. The x-axis shows the time periods of different building that you tested and the y axis shows the accelerations that they observed, not the ground accelerations but the building accelerations. 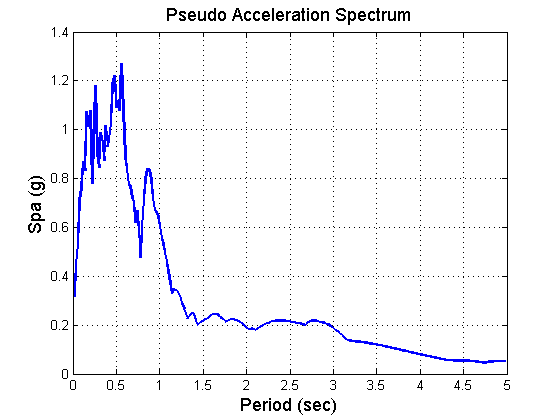 These building accelerations are called Pseudo Spectral Accelerations (PSA). Now all the codes have their own pseudo spectral acceleration (response spectrum) charts for a specific sight. What you have to test it, apply this acceleration to your building story and get the value of building shears. Why don't we text it for an actual ground motion? Well you can do that, but a single ground motion run to takes about 20-24 hours to produce the results. This is a long time and it is often not a cost effective method and besides it requires a very complicated modelling. So to avoid all the hurdle we assume that the building will essentially stay elastic and you just check the building base shear using these pseudo spectral accelerations after all you are interested in designing for the maximum response. But again this method is just limited to small structures. And each code has defined a building height limit till which you can use this method. If you want to build any taller then you will have to perform dynamic analysis of the structure. So this was just a basic introduction to the new blog series we are starting. A new series of blog posts that will be focused on earthquake analysis and design of building and we will discuss in depth about various methods we can use to analyse a structure for an earthquake.